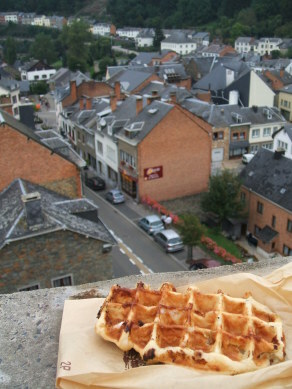 A real Belgian waffle! Overlooking Houffalize in the Ardennes Forest. I have been to Brussels a number of times, and I have never stayed twice in the same place. Hotel Galia is a nice small hotel near the Midi train station, at one end of the Jeu de Paume square with the big flea market on Saturdays. 2go4 is a hostel very near downtown and the Nord train station. Warning: they now have age limits. Sleepwell is a large and modernized hostel near the Nord train station. Good food and drink can be found most anywhere. But a real concentration of restaurants and bars is along Rue J. Van Praet, leading west from across from the Bourse. It's lined with restuarants down either side, largely Thai and Vietnamese. At the end of that block is a small square with a couple of two-level bars. One of them is Mappa Mundi, a nice place to hang out and watch the people.